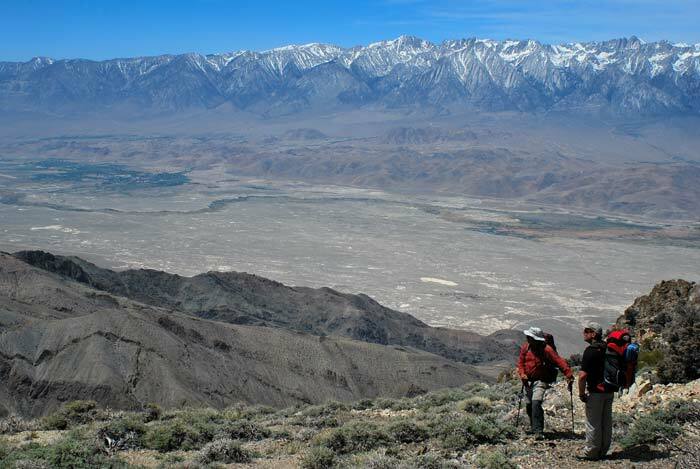 The Inyo Mountains is a high desert range that runs parallel with the southern portion of the Sierras, with Owens Valley separating these two ranges. Considering the breathtaking views from the Inyo ridgeline, I was surprised to learn not many hikers try this traverse. Tuesday morning, we left my Jeep Cherokee at the Inyo/Keynot 4WD trailhead (Route A in the DPS Guidebook), then drove over an hour in John's FJ Cruiser around to the Cerro Gordo Mine. This is the start for the long tour point-to-point traverse across the Inyo Range (roughly 25 miles) - see this 2009 report for a group that walked the whole way. However, there are two 4WD roads to choose from which can take you all the way to the base of New York Butte. This would cut off nearly 10 miles of walking between Cerro Gordo Mine and New York Butte, essentially the first day of hiking. Taking one of these 4WD roads to the trailhead is what I'm calling the short tour version of the point-to-point traverse (roughly 13 miles). Of the two 4WD roads, the Swansea Grade option (drive route B/western approach in the DPS Guidebook) was out of the question. This road begins in the town of Swansea in Owens Valley and is known to be pretty nasty - beyond the capabilities of our particular 4WD vehicles. The other 4WD road starts at Cerro Gordo Mine (drive route B/southern approach) and runs the Inyo ridge, but is listed as only for experienced 4-wheelers with high-clearance vehicles. The owner of the mine also warned John that he better know what he is doing if he takes this road. After taking in the warnings, we drove just north of the Cerro Gordo township to a fork in the road; the left fork leading to a unlocked gate with signs indicating that permission to drive this road can be revoked at any time. This was our road. The right fork leads to a locked gate with No Trespassing signs. Turns out the road was not as bad as its reputation would imply. Desert peak climbers who have driven on many of the 4WD roads to peaks on the DPS list would not find this road to be particularly difficult. A narrow cliffy section is covered in the first mile, which is outwardly sloped. However, none of us felt in danger...just take it slow and you'll be fine. The crux of the drive comes during the third mile while climbing steeply out of a valley. There are about three short, particularly steep turns on the way up, the middle one being the worst. However, John's FJ Cruiser with posi-traction handled the loose, rocky turn well. The rest of the drive was relatively easy. The DPS Guidebook directions note a number of cross-roads along the way. But most of these roads have become off limits for driving since the Inyo Range was established as a wilderness area. Stay on the main dirt track and you'll have no problem getting to the trailhead. We parked at a turnout a few hundred feet short of the end of the road. This parking spot, which can hold two vehicles, was also the beginning of the Inyo Crest use trail. The 11.5 mile drive took a little over an hour from Cerro Gordo mine. We started hiking at 11 am, each of us lugging 6 quarts of water in our backpacks. We were hoping to supplement our water with snow along the way. However, it had been a lower-than-normal snow year and there were very few snow patches left. After walking a mile, we dropped our packs and made the quick 150 foot ascent to the summit of New York Butte. Just below the summit rocks is a nice camping area among the trees. It also appeared to be a favorite camping spot for native Americans, as there were some small shards of worked obsidian around. South side of Keynot Peak from the Inyo Crest. Mt. Inyo is to the left in the background. Continuing our hike north, the open ridgeline had magnificent views of Owens Valley that rivaled the view from New York Butte. The use trail became increasingly vague as we neared a saddle 1.25 mi. SE of Peak 10,414 ft. At the saddle, we hiked over the top, or slightly left, of the ridgeline and proceeded down to Forgotten Pass. The terrain had been easy up to this point, but we could see we may have some difficulty from Forgotten Pass up to Keynot Peak. Rocky pinnacles cover much of the ridgeline, necessitating some sidehilling around them. We had an old route description from a longtime DPSer that showed we should ascend the ridge north from Forgotten Pass about 250 ft., then sidehill on the west side of the ridge over to a decrepit trail that would take us up to the ridgeline again just south of the last false summit (Pk 10,680+). However, we all thought a better route would be if you go slightly east of the ridge when the ridgeline itself got too rocky. We went against our better judgment and followed the old route description. What we found was loose and tedious sidehilling over scree, about as bad as anything you can find in the Sierras. We ran across a few remnants of the old trail but much of it was only marginally better than cross-country travel over the loose scree. (Another group had better luck finding this trail - see their 2009 report.) After an exhausting 2 hrs we finally got to the false summit, Pk 10,680+. At 7 pm, we made camp on the saddle between Keynot Peak and its false summit. Our camp was fairly exposed to the winds that came up from Owens Valley because the only flat areas were almost right on the ridge. But we were too tired to go looking for something better. However, there was a couple of small snowbanks in the saddle, which supplemented our drinking water supply. 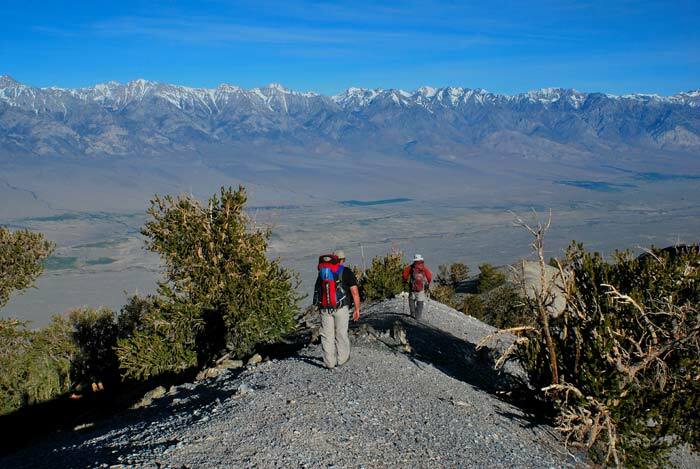 TK and John hiking along the Inyo Crest with spectacular views of the Sierras and Owens Valley. In the morning we hiked an easy 250 ft. to the summit of Keynot Peak, getting there by 6:30 am. After a short stay, we followed a use trail about 1.25 mi. through occasional snow patches down to Bedsprings Saddle. The use trail started down the right (east) side of Keynot Peak near its summit rocks, eventually gaining the ridgeline again to the pass. 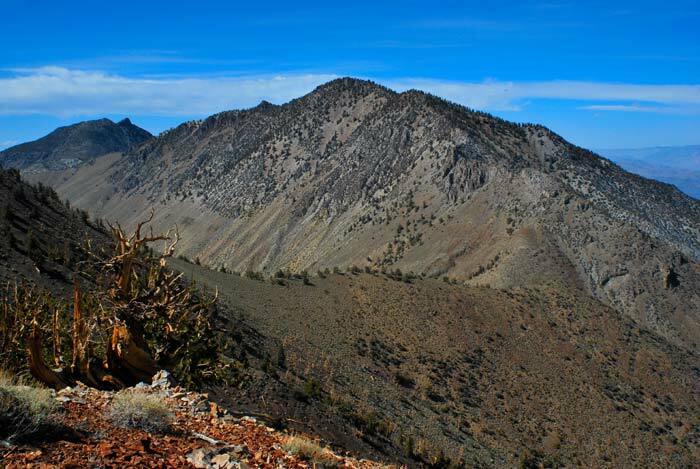 Some of the best views of our Inyo Crest tour were on this ridgeline. Also, the most snow we saw on the trip was on the north side of Keynot. Bedsprings Saddle is the higher, more southern of two low points between Keynot Peak and Mt. Inyo. We dropped our packs here and headed for Mt. Inyo. The hike over to Mt. Inyo passed through a wonderful little forested area at about 10,700 ft, one of the few flat places we ran across on the trip. Doug Mantle called this forest a magical place in the Mt. Inyo register, and I definitely agree. The remaining traverse to the peak from the forest was quite bouldery. The trip out to Mt. Inyo and back to the saddle took us 2.5 hrs. After an early lunch at the saddle, we descended the wash towards Pt. 9155. We soon picked up a use trail in the wash and passed through dry Bedsprings Camp about 600 ft below the Bedsprings Saddle. The camp looks like wonderful place for an overnight stay with many camping sites, but no water. Roughly the first 2000 feet of descending back to my jeep was very steep; hard on our knees and feet. However, the next 2000 feet of loss down to Union Wash was mainly in thick scree that we could plunge-step through. Not only was the plunge-stepping section fast, it helped our sore feet and knees recover! The nearly 5000 foot descent from Bedsprings Saddle to the jeep at the 4WD trailhead only took a little under 2 hours. View south down Owens Valley during decent to Union Wash.
We piled into the jeep and headed back to the New York Butte trailhead to pick up John's FJ Cruiser. I had worried about getting the jeep over the tough section of 4WD road near Pleasant Point, but it turns out I had nothing to worry about. My Jeep Cherokee spun and slid up the steepest curve in the road, but never got bogged down. 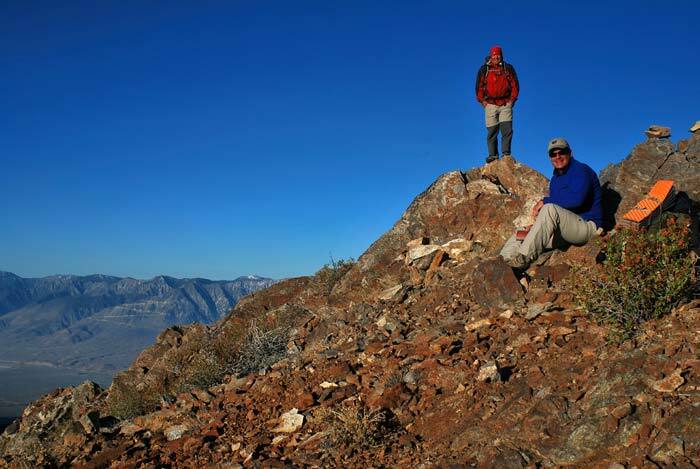 After picking up John's car, we drove back about 7.5 miles towards Cerro Gordo Mine and stopped below Pleasant Point and did the easy 30 minute walk to the summit. This was the first time (and probably only time) we had climbed three DPS-listed peaks in the same day!